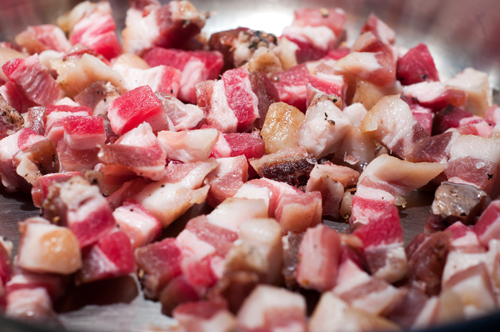 Home-Cured Pancetta – Part 3! 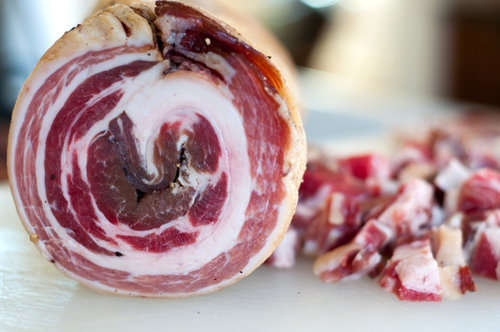 Clearly the best part of the homecured pancetta project is part 3, the finished product and my first chance to cook with it! After 2 weeks hanging to dry in my outside refrigerator (which still carries a faint smell which may never come out, be warned), I cut it down and sliced into the roll. I cut most of the roll into thick, 1/4 pound slabs, to be used in those incredibly great dishes that call for diced pancetta. You know, things like spaghetti carbonara or pancetta roasted brussels sprouts. 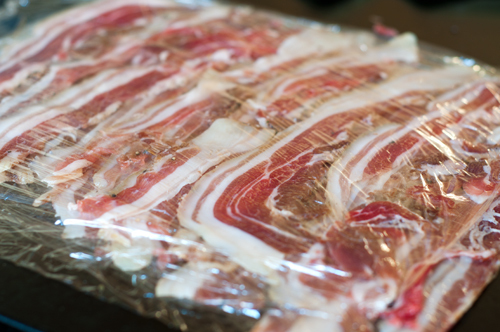 I wrapped each disk in plastic wrap and froze them – and note, there is enough fat in pancetta that you can dice it while still pretty frozen, so no need to thaw ahead of time. 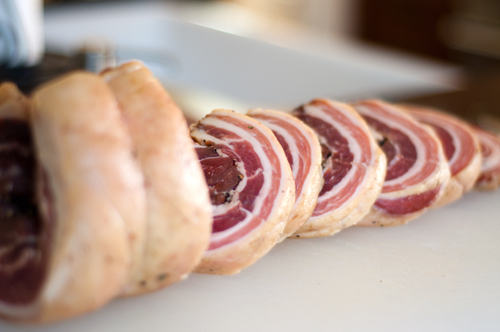 Other recipes call for thinly sliced pancetta – to wrap things like dates or shrimp – so I used a meat slicer to thinly slice the remaining 2 inches of the roll. That left me with thin slices that somewhat resemble traditional bacon, so I laid them in a single layer between sheets of plastic wrap, then put the whole thing in a Ziploc bag to freeze. 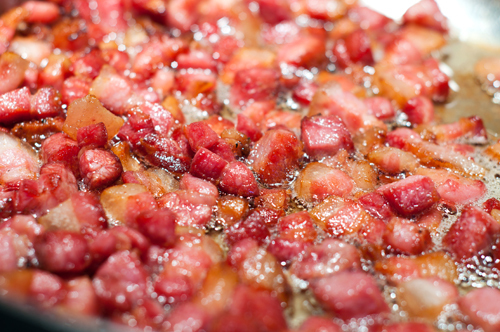 Of course, I had to try my creation right away, so I diced some up… …and threw it in a skillet to render off the fat and crisp it up. I left some of it only half way cooked so I could toss that with my Brussels sprouts on Thanksgiving to roast, and the rest I cooked until very crisp and quite brown. Then I simply tossed it with some leftover barley and farro “risotto” (great recipe – look for it next year in the cookbook I’m working on!) for lunch. What can I tell you? It was totally worth the effort, and I can’t wait to go ahead and cure the second half of the pork belly that’s waiting patiently in my freezer. 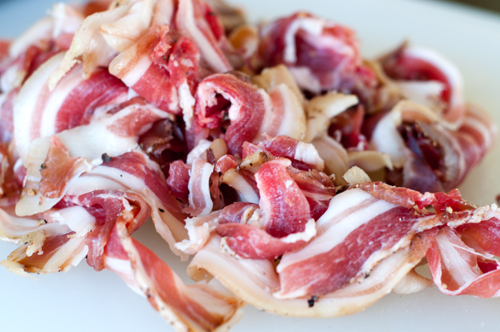 Do you have any great recipes that use pancetta? Share them with me and I’ll link to your site when I recreate the recipe!